In fairness, it didn't really feel any worse than veteran mode, which just made me wonder once again whether they made some kind of tuning error with the latter. Also, for all the complaining I've been doing about there not being enough resources about master mode chapters, this is probably the most well-documented one. Because it's so ridiculously hard, people have been more inclined to share their thoughts and videos about it than usual, proud to show off their knowledge and skill once they managed to beat it. 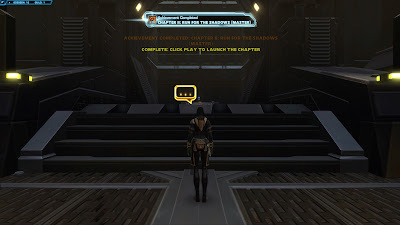 Initially I wasn't sure whether I should write about this chapter at all, considering that I already wrote about veteran mode and this felt largely the same, however in the end I decided that it'd be worth it anyway because I learned some more useful lessons this time around, plus the experience was just very different as a Scoundrel compared to a Guardian. On my Guardian I played much more offensively, trying to nuke things quickly and surviving via the use of cooldowns. My Scoundrel couldn't do that, but she could stay alive for a very long time due to her self-heals, so had to learn to dodge instead. Ironically, I eventually survived the vine cat by face-tanking it while letting Acina heal me, something that I hadn't been able to pull off on my Guardian. It only worked once I remembered to hit both my heroic moment and the Unity damage reduction cooldown at the same time though. Maybe my Guardian would have been able to eventually do it that way as well, if I hadn't been so focused on the "nuking her down while Acina tanks" tactic at the time (which did also work, eventually). The GenoHaradan scouting party really highlighted the differences between the two classes though. On my Guardian this fight had been pretty much a matter of charging in and hitting Saber Reflect at the right time so that the adds could nuke themselves, then taking down the boss while using some more defensive cooldowns to stay alive. On my Scoundrel I had to take a completely different tack. For starters, I was having trouble even dealing with the adds at the beginning. I figured that line of sight was going to be the solution, but struggled to use the cliffs for this purpose effectively. Fortunately I then came across this video, which shows a Sentinel doing the fight and was therefore of limited usefulness to me in terms of overall tactics, but the tip to start at the back of the ship worked great for me. With myself specced into heals and Acina set to dps, I pulled with an AoE to get some initial aggro, made the mobs waste a bit of time by trying to follow me into a little nook, and then set Acina onto them while making a run for it before the Scout Leader herself could get me. At some point I realised that there's a piece of wreckage behind the ship that's great to use as a "pillar" for breaking line of sight, and I eventually beat the fight by basically kiting the leader around it with my healing aggro while Acina slowly killed her. The second wave of adds also couldn't target me there, so they had to come up close and pile up, which allowed me to dispatch them relatively easily with some more AoE. In the end I even managed to succeed during an attempt where I didn't have heroic moment up and Acina died halfway through - nobody was more surprised than me when that actually ended up being the winning formula. Up next was the tomb horror. That one was kind of funny. I nearly killed it on my first attempt actually and was surprised by how easy that had seemed. On my second attempt I did horribly however and died nearly right away. Then I realised that as a Scoundrel, I could actually simply stealth past and completely skip this one, since killing it is not actually a required objective. So... sorry, no new tips on how to fight that one! But then... the final challenge: the GenoHaradan leader and hunters, which had remained unbested by me (solo) in veteran mode. 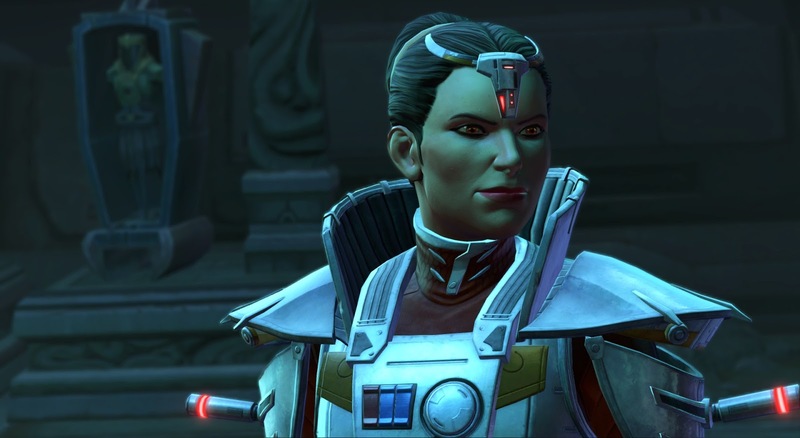 You'd think that would have been more demotivating than it was - but I felt quite confident in being able to beat the fight on my Scoundrel due to having better gear now as well as having much more control due to being able to CC one of the hunters at the start. In the end the fight was still far from easy, and I once again spent one and a half million credits on repairs on that fight alone (despite of the ability to run out of the room and reset attempts that went very badly without actually dying), as well as more than two hours of wiping. But I did get there in the end! The sheer randomness of the fight remains the worst thing about it, because there's just no way you can control everything and sometimes things just go down the drain instantly when one of the adds stuns you just as you needed to interrupt Hail of Bolts, or you get rooted in a Missile Barrage or what have you. Considering I always started with the same five or six moves, it was astounding how they could result in anything from a super smooth first phase to an instant wipe. The basic strategy I used in the end was to put one of the hunters to sleep and sic Acina on the second (making sure to have her AoE ability turned off so she wouldn't accidentally break the CC), while I did my best to keep both of us healed up and interrupt the leader's Hail of Bolts when required. Possibly the most important lesson I learned in regards to healing in this fight is that of the two dots that the adds can apply, the green one needs to be cleansed asap, while you can heal through the other one if required. Once the first add died, I would briefly put Acina on passive so I could use the next time the leader cast Ultimate Shot to heal us both to full, before telling her to attack the second hunter, who was usually about to wake up by this point. The first time I actually made it into the last phase, I kind of panicked / overestimated how easy it must be from then on without the adds, but you still have to take some care. I found this video helpful as an illustration of keeping your calm in the last phase, as you can see the player repeatedly "pausing" the fight during Ultimate Shot to allow Acina to heal her back up again. Once again, success arrived in a surprisingly messy manner - I let Acina die not once but twice, so that I had to complete the final phase without a companion! This was really slow as a healer, but I was able to keep myself alive by not panicking and going the slow and steady route. Video once again below. One thing I've got to say is that for all the times I swore at my screen because of a stupid wipe, and as much as I think that this sort of design isn't "good" difficulty - it kept me more engaged than anything else in the game has in a long time (no distractions needed, my attention was 100% on the fights) and I felt incredibly accomplished when I actually finished the chapter. While I'm sure that there'll be many more challenges ahead, from what I've heard I don't expect anything else in the coming chapters to produce quite this level of frustration. I also found a neat trick for beating the final boss fight. The ability to reset the fight by exiting the room sure helps to save money on repairs, but it makes a fight particularly difficult, because you end up in a confined space with very little room to run around and dodge attacks. So I thought - the fight would not reset upon exiting a room, if I do not enter the room in the first place! Simply sending Acina to attack one of the hunters from afar and calling her back after couple of hits make hunters to chase you outside, while you can run around the whole temple. They wouldn't evade even if you go to the very start of the area. After that the enemies can be separated - one of the hunters can be longstunned, while the boss runs slower then the hunters, because he takes time to cast firebombs and stuff. So running back and forth through the temple (be sure to scan for all the traps beforehand) and fighting the enemies one by one makes the fight much more manageable (at least as a heal, when getting some distance ahead is all you need to restore anything). It isn't the fastest way to get through this encounter - it took about 15-20 minutes for me, and I used my battle companion revive twice and three times my heroic moment during whole thing - but I think it's the easiest one, since I've beat it in the first try after figuring this out. That sounds like a neat trick! Slightly exploity perhaps, but I'm not sure anyone's going to mind considering the fight still remains hard as it is. Fighting a poor balance with other design flaws is a legit move in my book. I think this is exactly what Lana Beniko meant, when she said "We need to fight smarter, not harder." So my conscience is clear.